Welcome back for day 3! This blog hop is all about novelty prints from Kanvas--fun designs that make you smile--and our talented designing friends are offering up great ideas for using them! Be sure to stop back each day for a new tutorial. 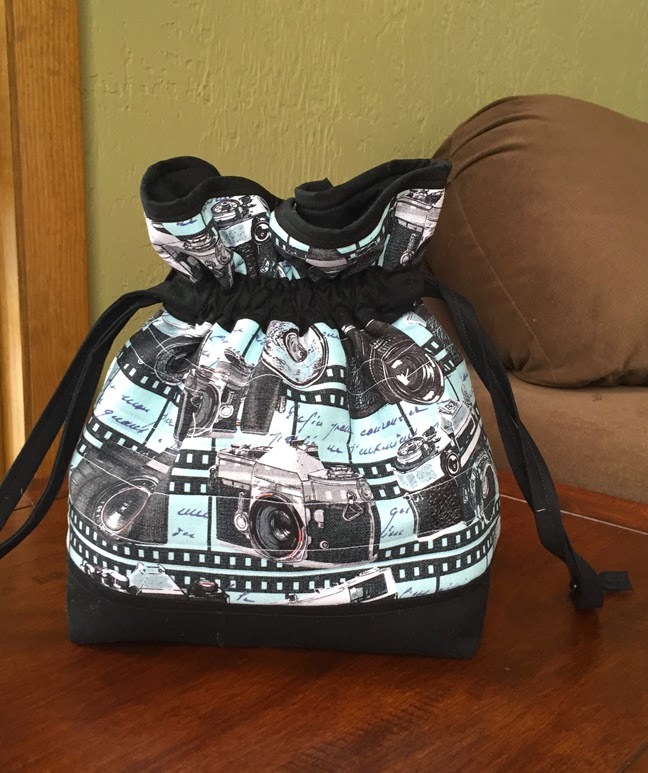 Today the Benartex design team is sharing a drawstring camera bag tutorial using That's Hollywood. Enjoy the tutorial, and then scroll to the bottom of the post to see how you can win a fat quarter bundle of the That's Hollywood prints. 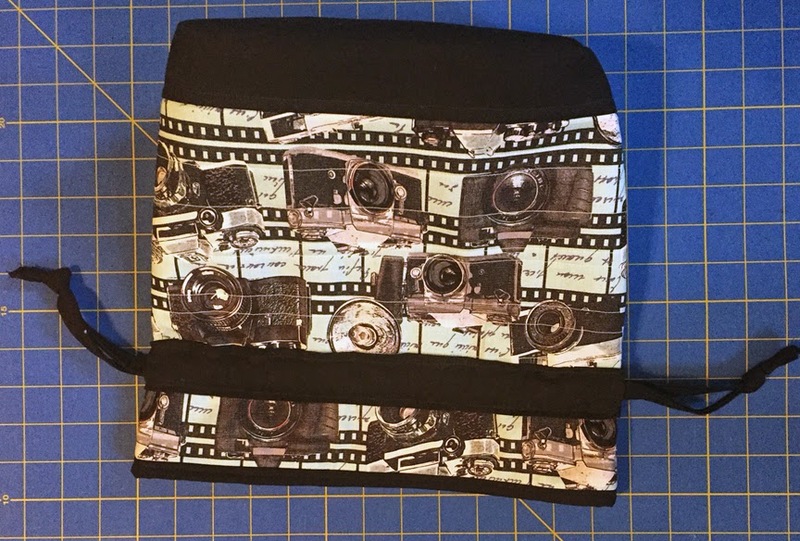 Today we'll be using the camera print from the That's Hollywood collection to make a padded drawstring camera bag. If you own more than a simple point-and-shoot camera, chances are you also have a heavy-duty camera bag to lug around. Which is great to have. But sometimes you just want to toss your camera in a tote bag or larger purse so you're not walking around with a bag (or two!) on each shoulder. Here's where this drawstring bag comes in. 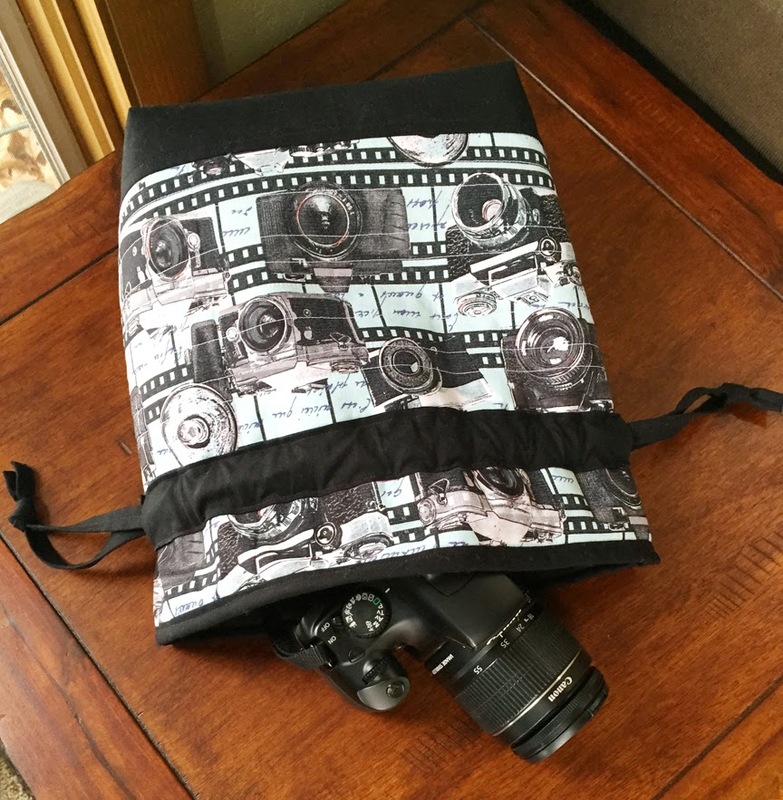 A layer of fusible fleece offers a little protection for your precious camera, but the the design is still small enough to be tucked inside a larger bag. And on top of all that, it's cute! 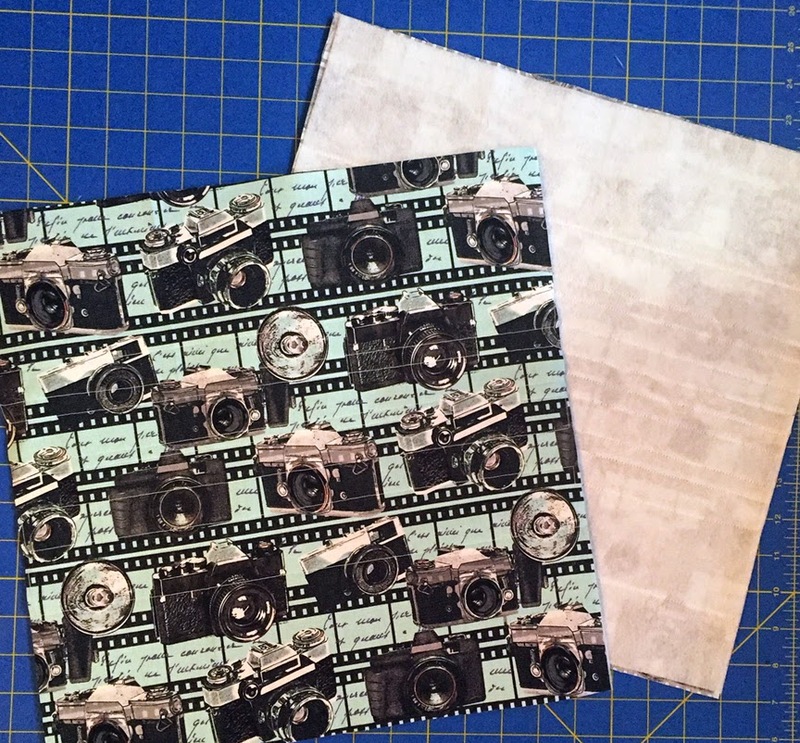 Here are the three colors of camera prints from the That's Hollywood collection. Aren't they fun?!?! Step 1: Following manufacturer's directions, fuse a fleece square to the wrong side of each 15" camera print square. Quilt each piece as desired. We did horizontal straight line quilting on the squares. Tip: Concentrate the majority of your quilting in the center 5" of the squares, as the bottom will be covered by the black base and the top by the casing. Trim quilted squares to measure 14". Step 2: Draw a horizontal line 4-1/4" up from the bottom of the quilted square. Lay a 5" x 15" black strip on the quilted square with the bottom edge touching the marked line as shown. Stitch 1/4" in from the marked line. Step 3: Press the black strip down over the bottom of the square and topstitch 1/4" from the seam line. 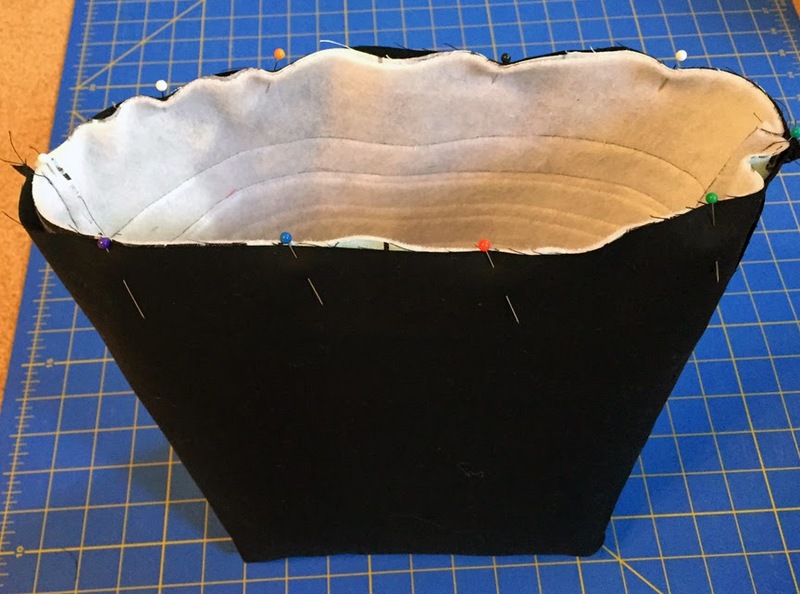 Trim excess black fabric as needed. Repeat on the second quilted square. Step 4: To make the casing strip, fold the long edges of a 2" x 14" black strip in 1/4" and press. On each short end, fold the fabric in 3/4" and press. Stitch both short ends to secure the folds and create a finished edge. Make a second casing strip. Step 5: Measure 2" down from the top edge of the quilted square and draw a horizontal line. Position the top edge of the casing strip on that line, centered from left to right. Stitch the top and bottom long edges of the casing in place with a scant 1/4" seam. This creates the casing for the drawstring. Repeat on the second quilted square. Step 6: Position the two quilted squares right sides together, matching up raw edges. Stitch along the sides and bottom using a 1/4" seam. Cut a 2-1/2" square out of each bottom corner. 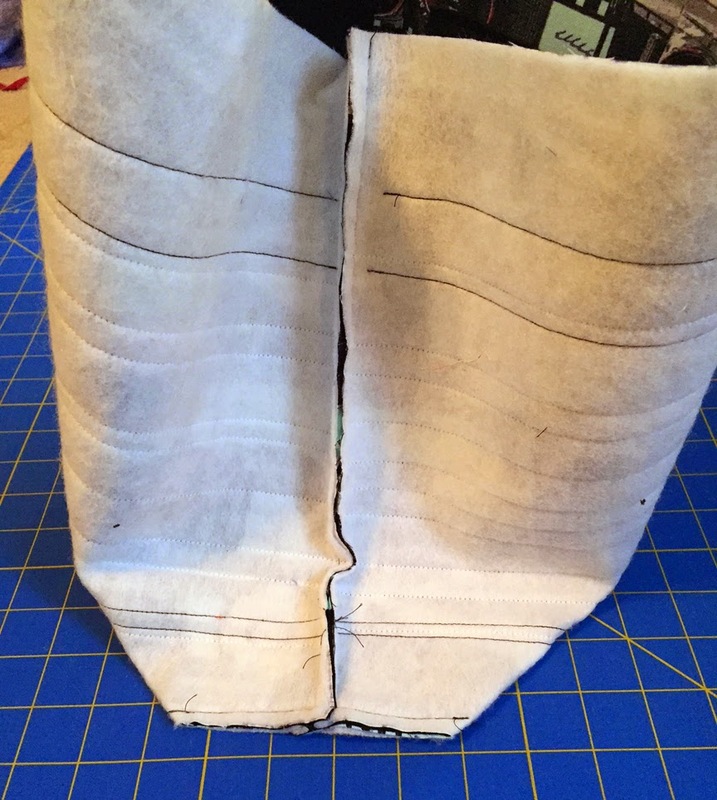 Step 7: To box the corner, fold the bag so the bottom seam and side seam meet. Stitch across the opening created with a 1/4" seam. Repeat on the opposite side of the bag. 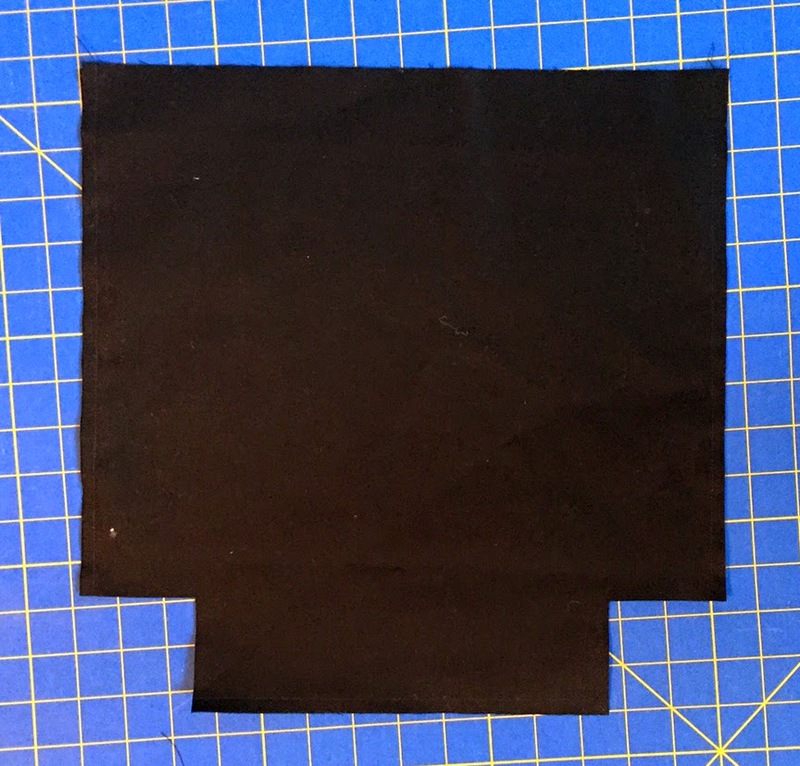 Step 8: Use the two 14" black squares to make the lining. Position them together and sew around three sides, leaving an opening on the bottom for turning. 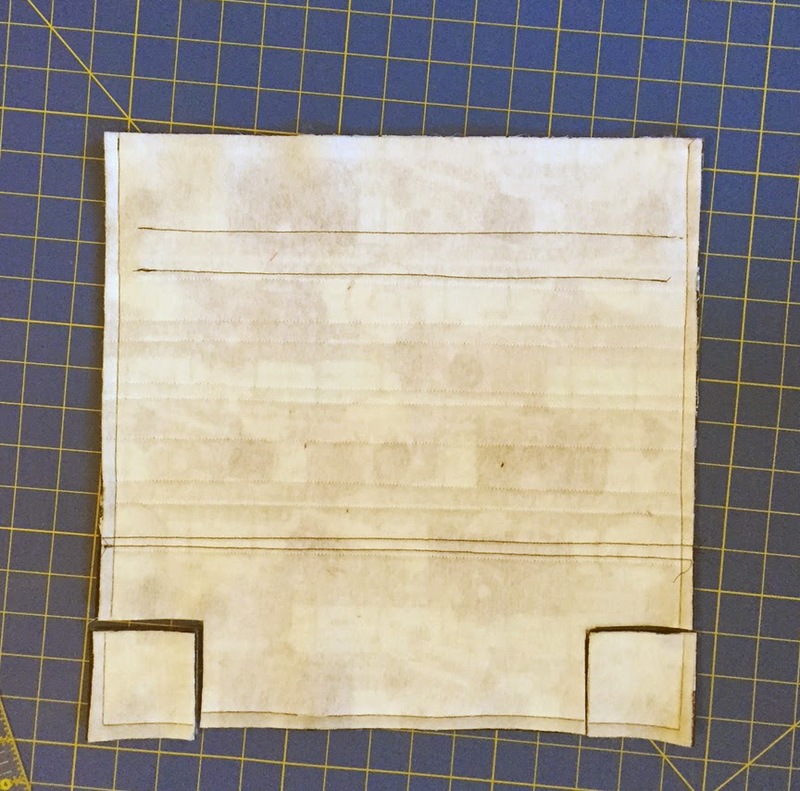 Cut 2-1/2" squares out of the corners and box them out in the same manner. Step 9: Turn the outer bag right side out and slide inside the lining (which is still wrong side out). The bag and lining should have right sides facing. Match the side seams and sew around the top edge using a 1/4" seam allowance. Step 10: Turn the bag right side out through the opening. Slipstitch the opening closed and stuff the lining into the bag. Topstitch around the top edge of the bag. Note: On our bag, the black lining shows slightly on the outer bag--that's just personal preference--you can tuck it all inside as well. The topstitching will secure the outer bag and lining together either way. 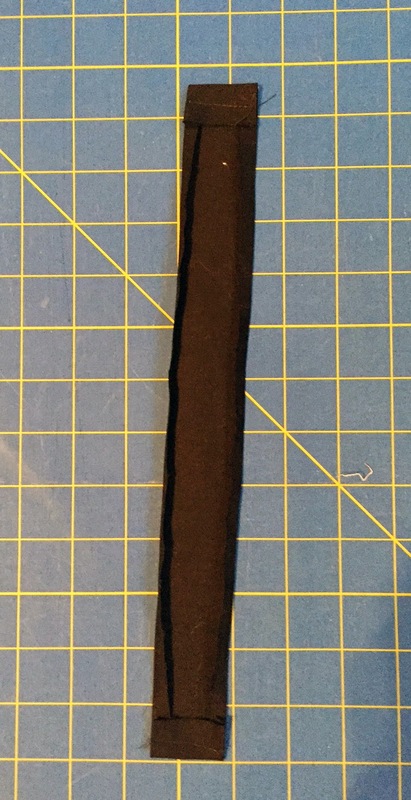 Step 11: Fold and press a 2" x 42" black strip in half, lengthwise. Unfold and press each long edge in to the middle fold line. Trim to measure 36". Fold the short raw ends in on both ends and refold on the center line to make a long, skinny strip. Topstitch the length of the strip to secure. Make two. Step 12: Using a safety pin, feed one strip through both sets of casing, starting and ending on the left side. Knot strip ends to secure. Feed the second strip through both sets of casing, starting and ending on the right. Knot strip ends to secure. Insert the camera for easy toting, and you're done! For a chance to win a fat quarter bundle of That's Hollywood, sign up to follow our blog either by email or through a blog reader (see both options in the right hand sidebar) or follow us on Facebook. Leave a comment letting us know that you follow, and telling us which print in the collection is your favorite. The giveaway is open through Tuesday, January 27 at 11:59 pm EST. p.s. Check out these clowns wearing pants made from this fabric! 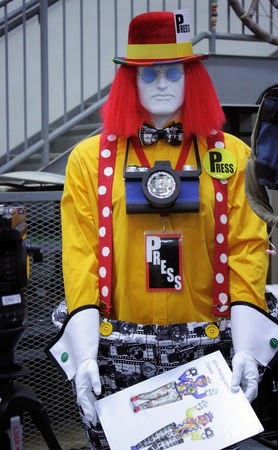 They were at the Macy's Thanksgiving Day Parade, taking photos for the Daily News. I love the cameras but the popcorn is pretty yummy too! I follow via Bloglovin. I follow on Bloglovin! Great camera case-so cute but useful too! I follow by email. I know just the person who needs that popcorn fabric. I follow you by email. Love the camera bag! I follow by email. The camera bag is perfect size. Thanks for the tut! I follow by email. My camera could seriously use a new case! I am following by email - thanks! Love the camera bag and that fabric is awesome!! This tutorial is just so cute and That's Hollywood just makes it even more cuter. Thank you for sharing with all of us and the chance to win that fabric for myself. I just might give this to my niece. I follow by email. My favorite is the camera fabric with the popcorn as a close second. I follow by email. Thanks for the bag pattern. I love the Hollywood Vintage print! I follow by email. Love the b/w camera fabric and the vintage Hollywood. Oh, and also love the pattern. Thanks! I follow on Bloglovin and I love the popcorn print. Thanks! I follow via email. Love the Pin-Up Girls!! All the fabrics are so fun! I follow you by e-mail. I love the camera print! I follow via email. I like the B/W Camera (Paparazzi) print best. I follow Sew In Love by email. 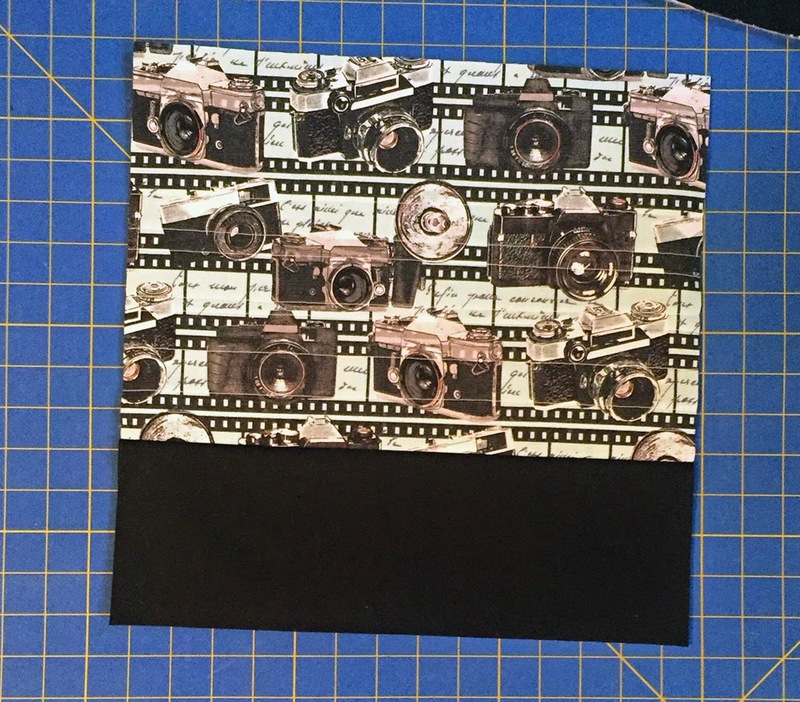 My favorite Hollywood fabric is the camera print, either B/W or aqua. The popcorn print could have a huge following, too. I follow you via email. My favorite is Paparazzi Aqua. Have a great day! I am following via e-mail! Although I love all the prints, I must admit I love the movie reels more! The camera bag is too cute, I can't wait to make it. I am following this blog by email! Love the giveaway! Thanks for the chance. I am a follower thru email. My favorite print is the glasses. I think I like the "Hollywood Stars Grey" print best. I follow you by e-mail. Love the film spools. The bag looks great! I follow via e-mail and FB. Thanks for the hop and the tutorials. Hollywood Vintage and Paparazzi Aqua are my favorites, and this bag looks great. I follow by email. Thanks for the tutorial. This bag looks substantial and rich. I love the camera print the best. O follow via GFC. I love these prints! I like the bag pattern, too. I follow by email. Thanks. My favorite is the popcorn black. I follow via email. The film spools fabric is my favourite. Just signed up for Bloglovin. Will be following you on it. Too cute! My favorite is the camera fabric, but that may be because of that darling bag. I follow via GFC and Bloglovin. Thanks so much! I love the camera prints! Great tutorial! I can see this with all kinds of prints. I follow by email, thanks! I follow with email. My fave print is Pinup Girls in black! Great drawstring bag tutorial. Thank you for that. Gosh, choosing just one fabric from a collection as a favorite is always so hard to do. I think Paparazzi Black has to be my most favorite, but I really love Movie Munchies Black quite a lot as well. That one would make such cute kitchen gifts like hot pads, oven mitts, or aprons. I am already a follower on Facebook, and also am subscribed via email to your blog. Thank you for the chance to win another super cute fabric collection. Thanks for the tutorial. It's very hard to choose a favourite fabric in this range, I love them all. Maybe the the camera prints, no maybe the spools. Sorry can't make a decision, love them all. I follow by email & facebook. I follow by email. 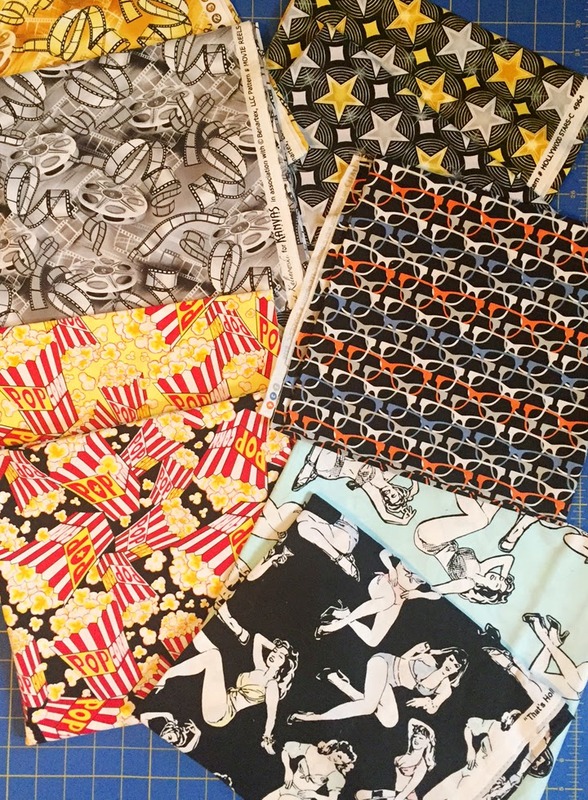 I think the popcorn print is my favorite, but I know a few guys that are going to want pillowcases made from those pinup girls!! I follow by email. I like the camera print. I'm a follower by email! I love the Paparazzi Black/White print, but the whole collection is gorgeous! Thanks for a chance! Popcorn! Makes me want to go to the movies right now. I'm an email subscriber and Bloglovin. Benartex team, you are fabulous!!! just signed up thru email...luv the camera print w/teal, hope I can make a bag for my picture taking sister. I follow you on Bloglovin and FB! 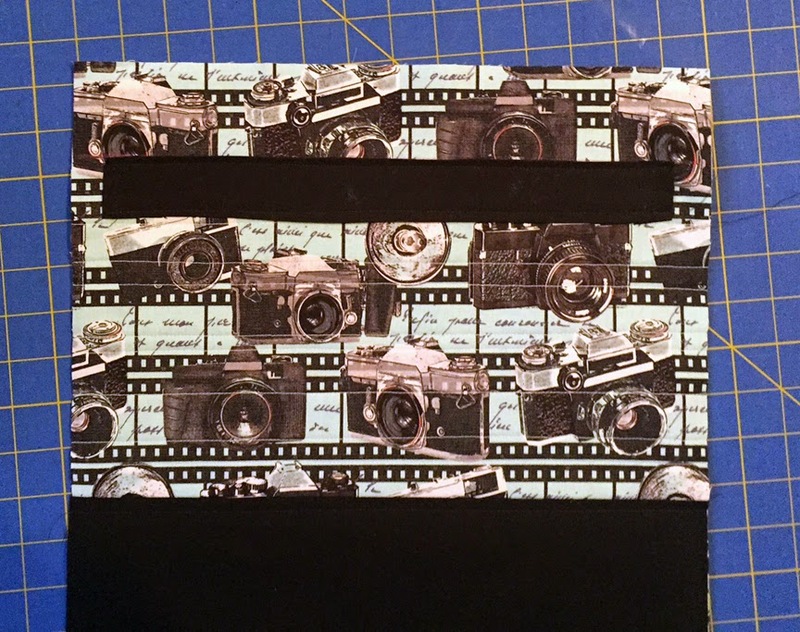 I love the camera bag and the camera print fabric in the teal color and black color. I follow via email. 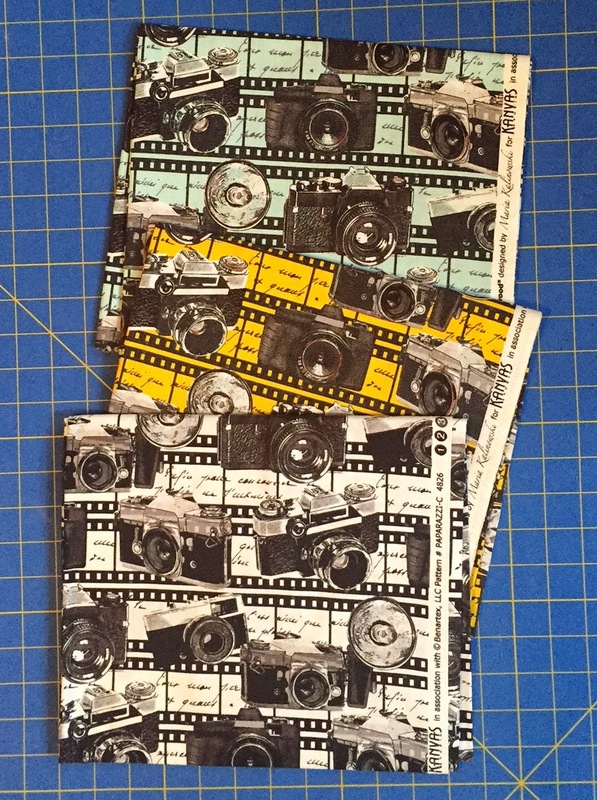 My favorites from this fabric collection are the Paparazzi Black/White and the Movie Reels Gold. Great tutorial! I like the eye-glasses print. I am a follower. I like the eyeglass print. Thanks for the tutorial. I will have to make one of these. Very adorable .It is easy to make also. I follow !! 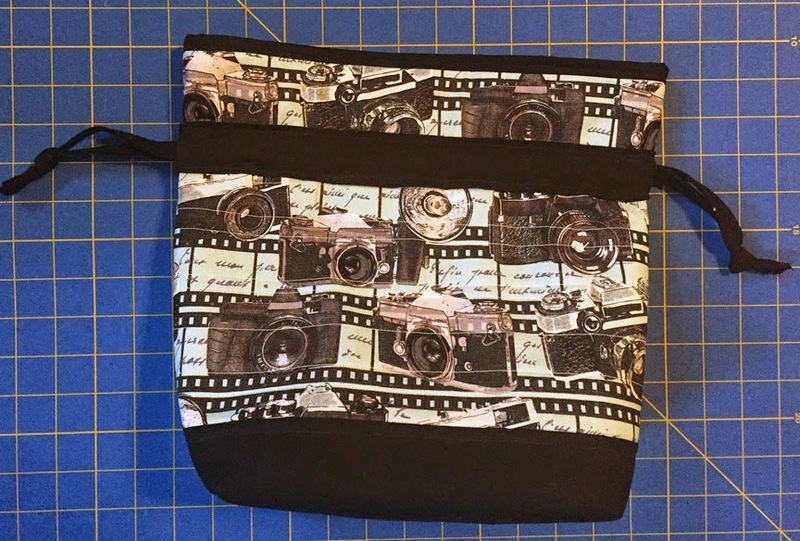 Love this fabric and the idea of a camera bag .Movie Reels Grey would make a great bag. I like you on fb, hope to glean cool ideas! I'd love to make sunglass bags w/the glasses pattern. I'd stuff them w/a pr of sunglasses in Operation Christmas Child shoeboxes!! Very nice camera bag - looks great! I follow by email! I follow by email and GFC. The multi-colored glasses print is my favorite! Great tutorial! Thank you! I follow thru bloglovin and my fave prints are the cameras in the light teal color. Thanks for the chance! I already follow you by email. My fave fabric is the star print! I follow your blog by email. I think my favorite print is the one with the glasses. Thanks for the tute and sharing. I follow via BlogLovin and Feedspot! I love the cameras and the glasses... I can't decide which I love best! I follow by email. Cameras, popcorn, and glasses...in that order. This ol' bag needs a new bag, and my camera would feel downright privileged. I love the camera fabric! Thanks for the great tutorial. This fabric is perfect for fun bags! I love the black and white camera fabric because my brother does black and white photography. I follow you on email, facebook and get the preview packs, so you know I always have room for fabric. I love the stars. I follow the blog via email. Thanks for the great tutorials and fun "hop"! 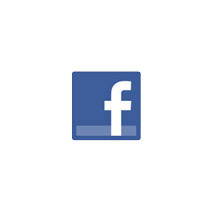 I'm a facebook fan! 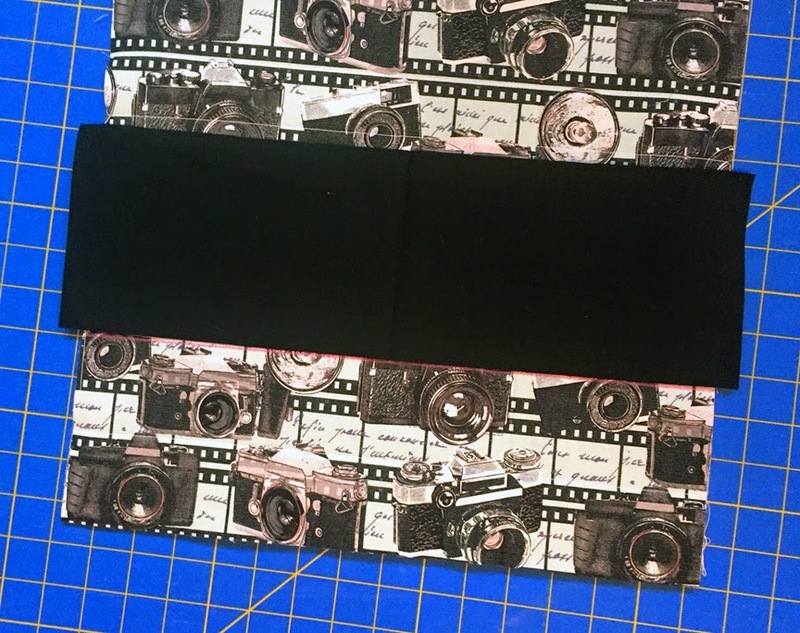 I love the camera print fabric! Cute fabric and I love the bag!! I follow via bloglovin and I love this print the cameras and the pin up girls, both totally fun prints. I follow via bloglovin. It is oh so difficult to choose a favorite but I'd say the camera and the film reels would be my top picks. Bloglovin follower! i like the camera print! Great camera bag! I follow the blog via Bloglovin. I really like the camera fabric as back in the "olden" days I had a 35mm camera and thought of myself as an amateur photographer. Following you on facebook. I love the camera fabric and the popcorn too! 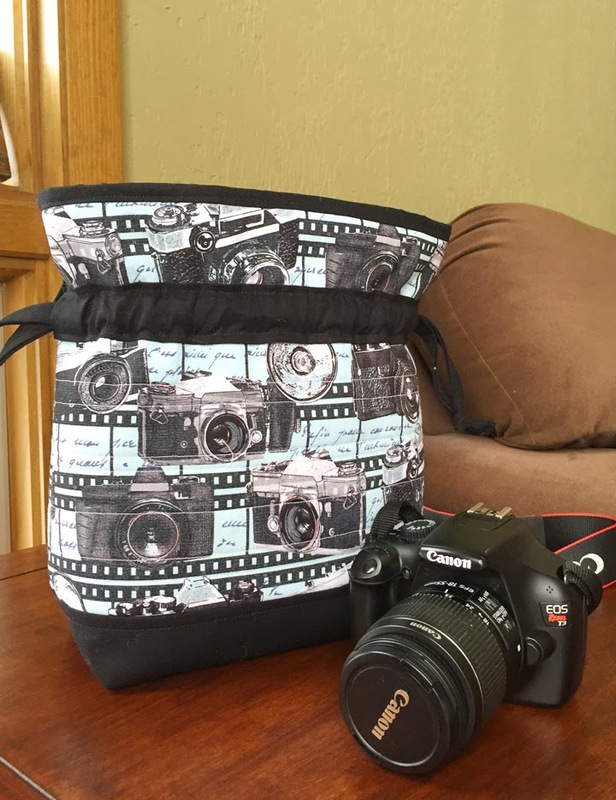 follow you by bloglovin, Love the camera fabric along with the rest of the fabrics. Thanks for the fun. Follow you on bloglovin. I probably have more novelty fabrics in my stash than any other and constantly using them for special projects. The camera fabric is very cute. Great bundle of fabrics. I follow your blog with RSS Feeds. Thanks for the chance!